I first stated talking to Grant Bond back in 2006-2007 when he was working on Revere with Ed Lavallee. After doing an 11 Question Interview with Ed and Grant as well as talking with them on Kryptographik we formed a friendship which is still ongoing today. 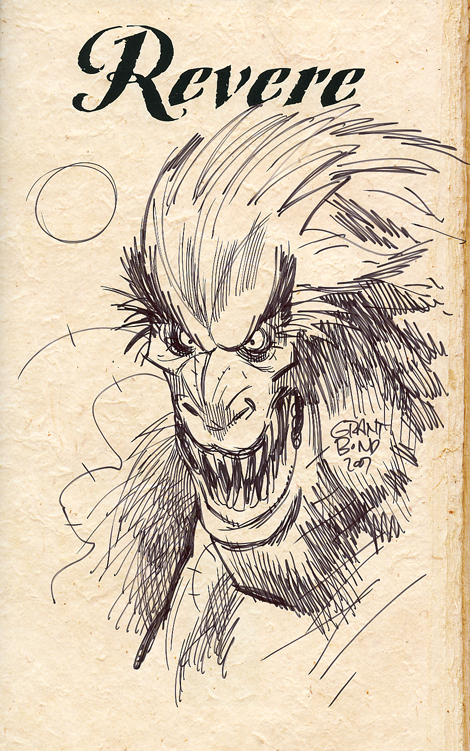 The image below is a sketch he did for me in my Revere Hardcover which came out in 2007 from Archaia. Revere has had a bit of a bumpy ride in coming out as it was originally coming out from Alias Enterprises who towards the end of it’s 4 issue Mini series totally changed their direction and if I remember correctly went to do more christian based comics which that meant that Revere was to be lost as it was a horror title. With that being said They went looking for another publisher and Archaia was willing to take them on board and we managed to see the Hard Cover come out in 2007. Also if your have a copy of the hard cover you may notice that there is a 2 page story in the back of it which was written by me for Grants Forum and ended up getting printed in the book! If I only had more time in the day I’m sure Grant and I could work on something again! With that being said here’s the Sketch that he did in the book for me.